A long, long, time ago, I was an author of a cruising website. And now I'm a land lubber, just a guy with some projects and more to do in life. I know it's been forever since I updated but it is time to get back into the spirit. I've been up to a bunch of stuff. The main thing that has happened since we got back from the Bahamas is we got a call that we were needed. That is a complement! We have some very good friends up in Omaha and one of them was having some surgery that was badly needed. The good news is that the surgeons did their job. The bad news was that it was a pretty involved surgery for the leg. The good new is that they really did a great job and my friend is going to have and did have after our visit, more mobility than he's had for years. Thank you surgeons!! So, without pictures - you wouldn't want to see them. Deb and I went up and spent three weeks helping take care of our friend. I want to tell you this was one of the most rewarding experiences I've had in my life. I helped him walk for the first time in 4 weeks, provided physical therapy, took care of changing bandages - over 200 stitches - GREAT surgeons! And, I gave my first shots. Well, at least most of them were pretty good. Sorry about the one that kept on giving. Let's talk about that one shot. You have to understand that I don't want to hurt people and if you want to give a good shot you MUST simply insert the needle quickly. HOWEVER, on that day, I just kept feeling the needle myself and just couldn't quickly shove it in. OK, I'm a whimp. I admit it. Regardless, I practiced again on a green tomato and it went fine from then on. Overall, it was a great trip in unfortunate circumstances with very good friends. I was truly honored to be a part of this recovery! 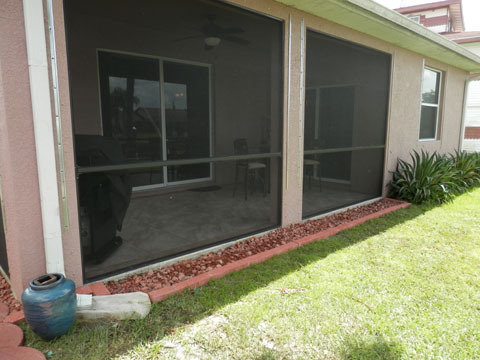 After returning home from our cruise, I screened in the back porch and tiled it. When I say I did it, that actually means I did all of the labor. 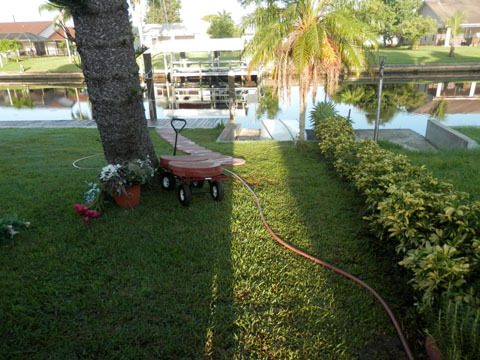 It came out great but I promised Deb that when we got home in mid August, I would make a sidewalk down to the dock. 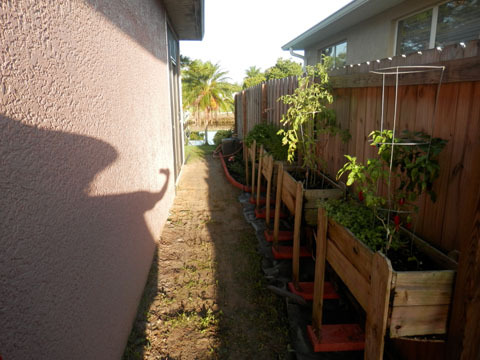 That project turned out to be a bit more than I expected since I also decided that we had space that we could add to our herb garden and grow a bunch of veggies too. For this we actually have pictures. To the right you can see how it started. I had already built planters for the herbs we use in almost every meal. These are great since you can tend to them without bending down. In addition, I have a cool automatic watering system to take care of them while we are gone. 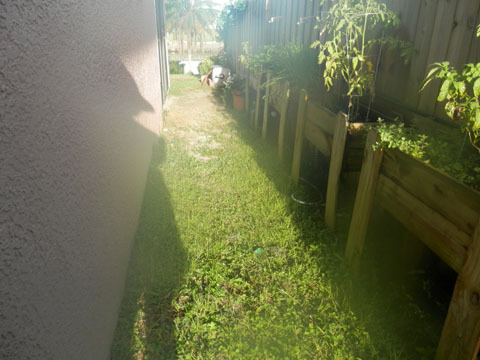 To actually make the watering system more accessible and less obvious, I extended the hose bib that came out on the Lanai out to the fence. 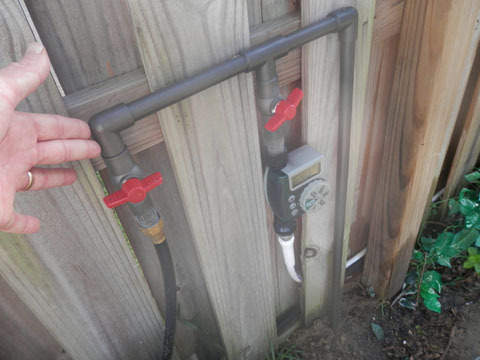 To do this, I made a PVC manifold, ran the line underground, then up and through the screen behind a buffet and connected it to the hose bib with a stainless steel washer hose. It came out fine after I painted it. To the lower right you can see the automatic watering system and the other valve goes to our water hose. I started with sand which was used as fill from when they created the canals. From this I cleared out all the junk weeds - even though they were green. Then I dreamed up a plan. 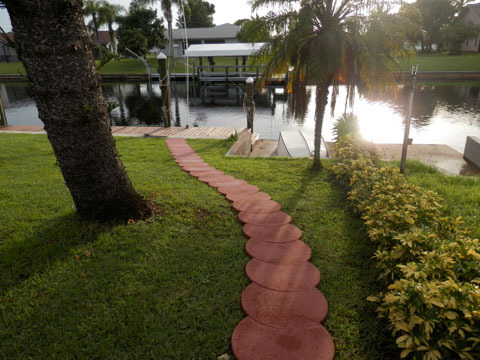 A curving walkway to the dock which also was going to enclose another planting site. This ultimately expanded as the project grew. Don't all of these projects grow? Below left you can see what it looks like as cleaned out the weeds and made the edging for the new planting area. In addition, I placed the planters on colored concrete to match the rock that would be inserted when done. 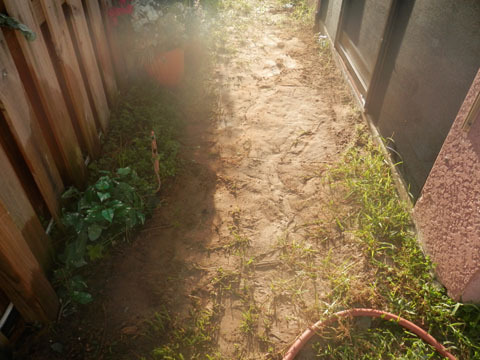 Below right you can see the hose I used to create the outline for the walkway. This is actually important because it is easy to move. I learned quite a while ago that at institutions you shouldn't put in sidewalks first. Wait a year and see where people walk. There is a shortcut. Walk it yourself as a "real person" and see where you go. 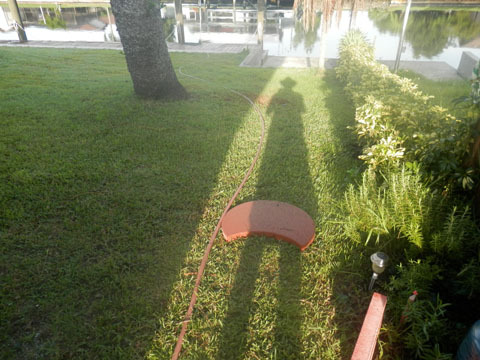 Move the hose around until it matches where you walk, and looks good, then start out with the walkway. 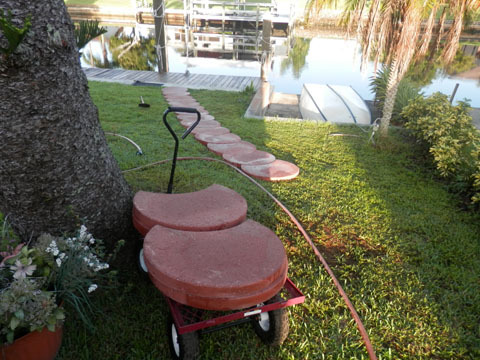 You can see I'm going to use a 3/4 moon concrete pavers so the walkway can wonder where I want/need it to. We started with a full circle of concrete and then used another 63 pieces of 3/4 concrete slabs. It was a bunch of work and in the mornings down here in Florida the humidity is in the upper 90%, we are talking 96 to 97% at 7 am. Then it starts dropping down. You get used to it but the good thing is you sweat a whole bunch. People pay to do that so I see it as my cleansing workout with a real result. To the lower right you can see the walkway taking shape. Once the walkway was laid, then came the rock to fill in the spaces on top of the weed guard. 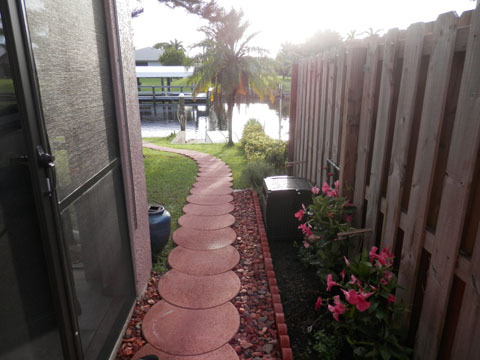 I decided to take the walkway close to the house until it reached the doorway into the Lanai. Then wonder it over closer to the planters as you can see in the pictures. 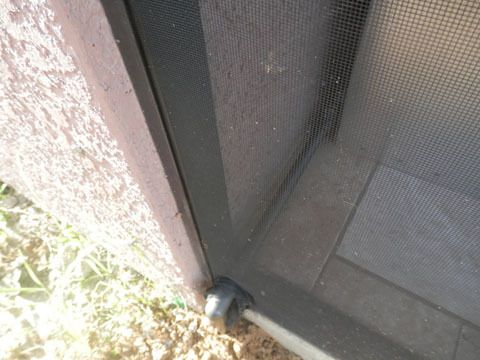 Below right you can see the screened in area I put up along with the tile and rock outside. The rock was put in so dirt wouldn't splash up on the screens when it rained. It rains every day here during this season. So, I got excited about my herbs and decided to extend the walkway. 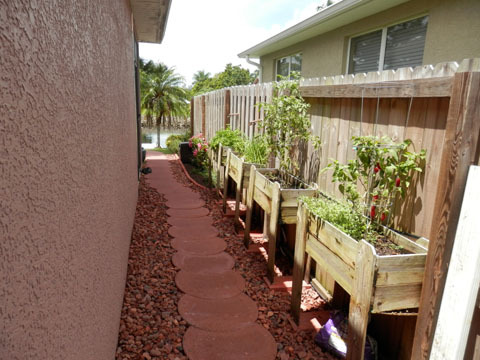 What you see to the right are some above ground planters I made along with an extension of the walkway not to mention the watering system. 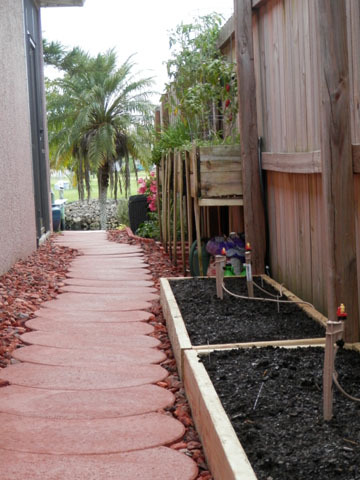 The walkway took a slight jog and is ready to service the lettuce, carrots, beans, broccoli, squash, along with some sugar snap peas and cucumbers. Of course that is if they all sprout. Now to see what color thumb I have. 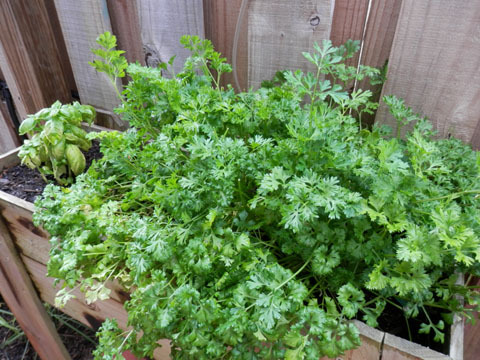 I took a couple pictures of our parsley that we use almost daily either for flavor or color. 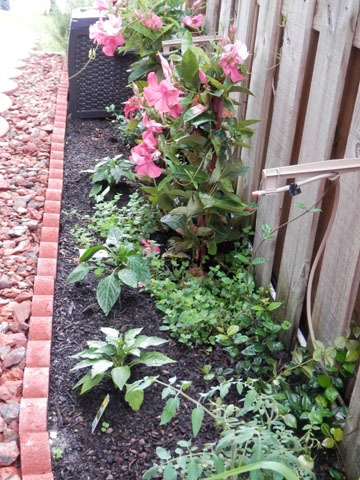 Then some more plantings - these are more than color - peppers and now some more basil. So what's next? Who knows. I think we will be planting more seeds over the next few weeks so things mature at different times and we have a longer season. Hopefully something will grow!!! !